Just steps from Penn Station and Madison Square Garden in Midtown West stands the Davos, a brand new 15-story midrise on 143 West 30th Street. 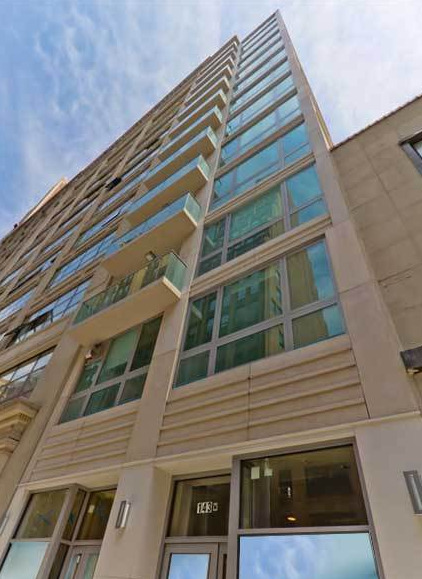 This luxury Manhattan apartment building is unique in that each apartment can be either bought or leased, which makes it a good investment for both renters and buyers. The Davos is made up of 24 one-bedroom luxury apartments, with 2 duplex penthouses on the top floor. Like many new buildings, the Davos is energy efficient, with state-of-the-art sprinkler and security systems. Located in the thriving metropolis of Midtown West, this building has much to offer the New Yorker who wants to be in the middle of it all. The apartments in the Davos are loaded with comforts and conveniences. Each home comes with a personal balcony, as well as a decorative fireplace, a washer and dryer, and central air conditioning. The kitchens come fully equipped with stainless steel appliances and a wine cooler. Decorated with Caesar stone countertops and tiled floors, they provide an excellent spot for residents who enjoy cooking, or who just want to enjoy some takeout. The bathrooms are similarly lush, with Whirlpool bathtubs and marble floors. Bedrooms have oak hardwood floors and walk in closets. The apartments are designed to be modern and spacious, and each one comes with some furnishing, and 9 ½’ ceilings. Amenities in the Davos complete this vision of luxury. A doorman is on hand to welcome residents in and out of the building, and an elevator brings them to their homes. The building is also wired up for cable and high-speed Internet. But residents will be forgiven for spending most of their time outside, where Midtown West offers more to do than is possible in a lifetime. Not only is it the home of countless trendy bars, restaurants and shops, but famous New York City landmarks like the Empire State Building and Macy’s are just a short walk away. New Yorkers in Midtown are always looking for a rush, and with an apartment building like the Davos, there’s little doubt their needs will be met. I would like information on apartments in The Davos. Please contact me ASAP.